FS: 2010-12 OEM Fog Light Kit! Easy install w/included wiring! Watch the video! 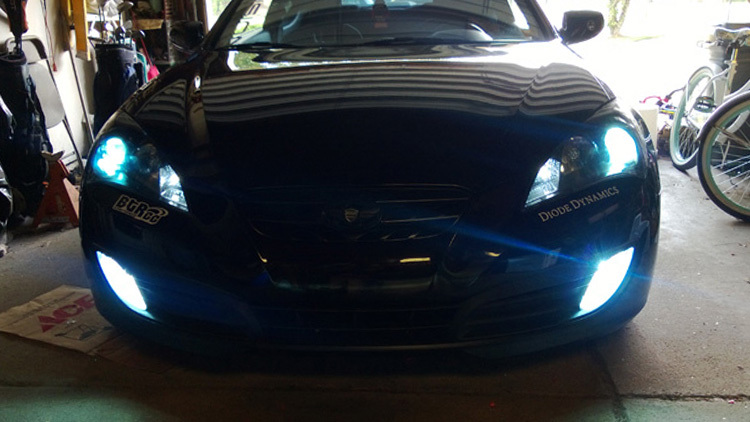 This kit contains everything you need to add OEM fog lights to your 2010-2012 Genesis Coupe that did not come with OEM fog lights, and convert them to HID or LED during the installation! Using these items, your fog lights will turn on with your headlights. This kit does not include an independent fog light switch. Make sure to watch our installation video! *Installation can be completed in 1-2 hours, on average. Amazing before and after results! Last edited by Diode Dynamics; 08-14-2014 at 11:47 AM. In stock and ready to ship same-day! How much just for the 881 HID Kit and Harness? So I got your fog light 881 kit today and the signal wire is just a socket, but on the video there is a plug that goes in there so you can tap into the headlight harness....I didnt get any taps or the signal wire plug. Went to web site to buy and it said Out Of Stock ?????? Sorry, I think there was an error with the listing. Should be updated by tomorrow afternoon. Thanks! Last edited by Diode Dynamics; 09-02-2013 at 04:50 PM. Bought this very easy install. Great for people who own a rpsec like me. Have you posted any pictures yet? Last edited by Diode Dynamics; 12-18-2013 at 07:54 AM. It depends what bulbs you put in the housings. HIDs will provide you with the most usable light output in the housings and 3000K HIDs typically work well in foggy conditions. Is there a reason why i can't find this kit on your website?